With endless summer pool BBQs, picnics and get-togethers of all nature, the summertime has a way of luring you toward snacking favorites like hot dogs, burgers, fries, potato chips and soda. However, if you really listen to your body, it’s telling you that it’s craving the opposite. Your body heat rises in the summer, leading to excessive sweating, dehydration and a decrease in critical electrolytes. Greasy and heavy food that are high in fat content will only act as an insulator and raise your body temp even higher, causing you to dehydrate faster. An appropriate diet for the summer will keep your body thoroughly hydrated with a healthy electrolyte balance. Try these summer snack ideas to keep your body light and happy this summer! Smoothies are perfect liquid snacks that fill you up and keep you hydrated at the same time. Easily portable, you can take it on the go for any summer adventure you have planned! Fruits like mango -rich in vitamin A & antioxidants - and watermelon - with high water content - are ideal additions to your choice of beverage. For a weight loss and time saving option, Bariatric Health & Wellness has low-calorie smoothies and fruit drinks that are excellent healthy summer snacks. As such a versatile source of protein, it’s hard to go wrong with eggs. And deviled eggs have got to be the quintessential summer appetizer, easy to make and absolutely delicious. However, we love the idea of opting out of the traditional mix of yolk and mayo and replacing it with homemade guacamole. Providing a good dose of healthy fats, it’s a “clean” twist to a traditional snack. There’s no need to suffer completely at a barbecue – drooling miserably at the grill in front of you. Instead of greasy burgers and sausages, try making shrimp and vegetable skewers. Many vegetables are high in water content – so as long as you don’t pack on the dressing, they remain easy on the stomach and your digestive system. If bland flavor is an unforgivable issue for you, a homemade pesto sauce can easily pack on the flavor in a healthy manner. What is a summer meal without some sort of carb-rich pasta salad or casserole gracing your presence? While you still need a significant portion of carbs to give you energy throughout the day, an exorbitant amount of simple carbohydrates can leave you feeling especially heavy and listless in the summer. Switch out your regular, refined pasta for some whole grain pastas. Research shows that whole grains may lower the risk of diseases like diabetes, cancer, obesity and heart disease. There’s no greater pair, no better match made in heaven than summer and ice cream. Still, it’s a dessert rich in cream and fats, and it’s all too easy to reach for this snack when it’s hot outside. 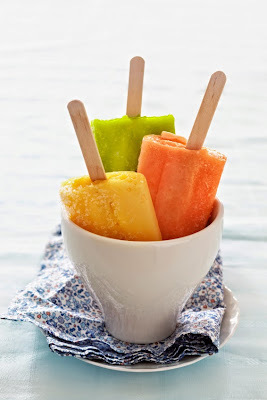 A lighter daily option can be homemade popsicles. Although there are a lot of healthy icy alternatives in markets today, making your own popsicles means you know what ingredients are going into them, and into your body. Side tip: add chunks of fruit to give these lick-able treats some texture. With these healthy summer snacks, you’re sure to be feeling more energized for all of those summer activities and adventures ahead of you. Stay hydrated, and have a delicious summer!